The following article was written by Landscape Designer Allison Desbonnet. At 12:45pm on Thursday, January 4th, Boston recorded its highest tide since 1921. This beat out the Blizzard of ’78, and in a peculiar way too. In ’78 it took days and multiple tide cycles for the prior record of 4.82 feet above high tide to be reached. In contrast, last month’s record took just a single tide cycle. As summer hurricanes and winter storms become more prevalent, so does the flooding that comes along with them. This storm happened so quickly that an emergency response team needed a boat to navigate the street in order to rescue those driving in the affected areas. In Scituate, the tide crashed through the seawall, damaging around 7 feet of it. As landscape architects, we consider the effect flooding has on the site and the plants. What can we expect from a flood incident? How can we adjust our designs to be better able to accommodate water inundation? When we know that a storm of such magnitude is heading our way, is there any short-term prep that can be done to better protect our waterfront vegetation? Pruning or removal of weak, dead trees or branches will prevent some significant damages that may occur during high winds. We tend to use vegetation as one of the answers to reducing storm surge and the negative impacts on our land. This is especially effective in dune and beach restoration, and typically occurs directly along the water’s edge. But what about those times when a storm causes the sea to come much further into our city than usual? Soil composition is changed. Sediment is deposited over the roots, reducing the plant’s ability to intake oxygen. This fast moving debris can girdle a tree by removing bark and vascular tissue. The natural gas exchange between trees and their environment is disrupted. Trees can only last a few days without proper aeration before they start to die. – Once the roots are vulnerable, Armillaria root rot can move in, primarily effecting oak, chestnut, and larch. – Many species are susceptible to Phytophthroa and Pythium, which are both ‘water mold’ diseases. Flooding increases the pH of acidic soils and decreases the pH of alkaline soils. Different tree species vary in their tolerance for pH changes, as this imbalance can block their ability to absorb them. 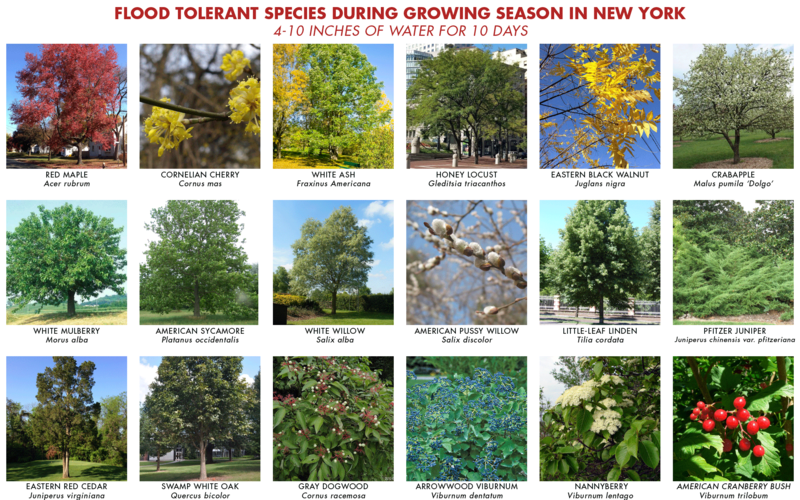 Trees are most effected by flooding during their growing season, specifically during late spring. If trees are flooded during a heavy rain or snow melt in the winter, the flooding will not be an issue. However, what if this is salt water from the ocean, like what we just experienced? What are some symptoms of flood stress on trees? All plants can respond differently to flooding. This all depends on species, the state of health, and site conditions. Common signs are leaf chlorosis, defoliation, and development of epicormic shoots. What can be done post-flood to give the trees a better fighting chance? Wait for the flooded soil to drain naturally. Trying to improve the soil before the water has drained will cause compaction issues, as it is still heavy with moisture. Flooding significantly removes nutrients as it erodes the humus-rich topsoil. Add organic manure to recreate this layer. Test the soil for pH, add lime to bring it back towards neutral, as flooded soils will typically become too acidic. Prune off all newly broken branches and remove debris. Remove sediment around the extent of the roots.